Small Studio in the Old Town is in a wonderful ancient street full of atmosphere and nightlife, you’ll have at your disposal a beautiful and independent studio, fully furnished and equipped. Air condition and WiFi and a really new property (renovated in 2016) will help you to relax and enjoy a comfortable stay. Small Studio in the Old Town is located in “Nazario Sauro” street, in the hearth of the historic city center, at few meters from 2 Towers and main square. In a wonderful ancient street full of atmosphere. 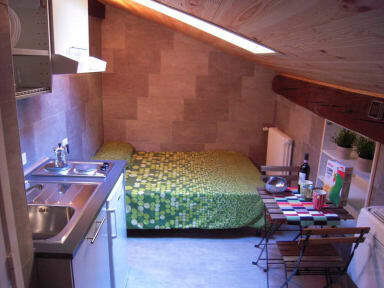 At Small Studio in the Old Town, the studios are provided for short and medium term rentals. It is ideal for a couple. 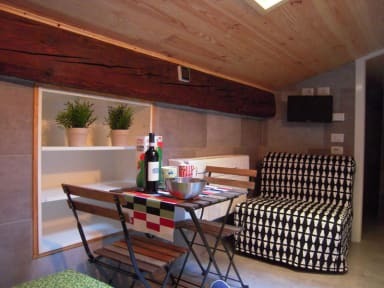 It has a cooking area, a double bed, a single sofa bed and a bathroom with all comforts (toilet, bidet and shower).